JBL On Stage 400iD review | What Hi-Fi? 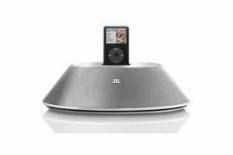 Appropriately enough for a product called ‘On Stage', JBL's 400iD dock has a suggestion of the plinth about its design. That, or something that appeared as an extra in Wall-E. Either way, it's a distinctive device . Specification, on the other hand, is more run-of-the-mill: 30 watts of power, a 3.5mm input alongside a USB input at the back of the dock, and a remote control of no discernible charm are all pretty much par for the course at this sort of price. Initial sonic impressions focus on the hard, thin and unyielding high frequencies. This is counterbalanced by the substantial bass, which wants for nothing where presence is concerned but would benefit from more precision. The result is a classic squeeze on the midrange: voices fight a losing battle against the furore above and below them. On the plus side, there's good tonal variation to low frequency information and, while it's pretty harsh, there is at least good precision and speed at the top end. The JBL is quite potent, dynamically, too. But its overall performance makes it no more than a mildly diverting alternative to the front-runners in the class.